The 17th Century Italian master Caravaggio painted two works titled Supper At Emmaus, one in 1601 and the other completed in 1606. 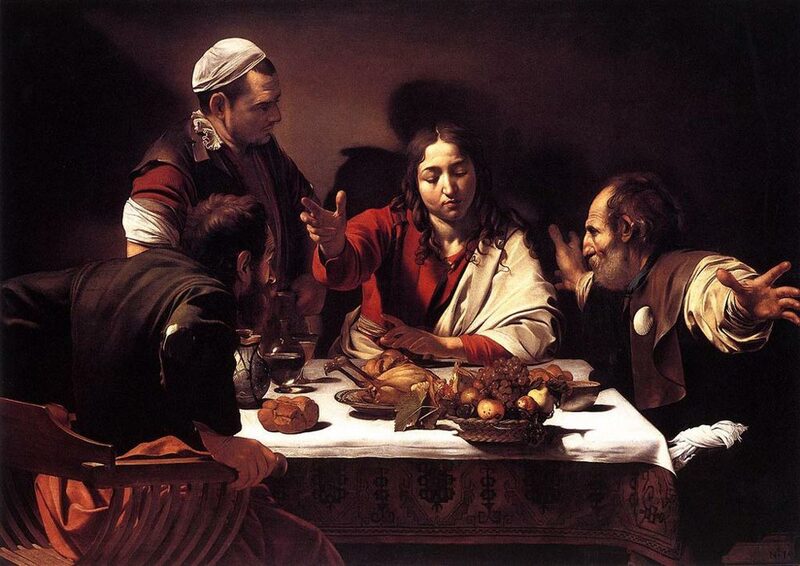 Generally, the latter is the one most often referred to when speaking of the Supper At Emmaus, although one must remember there are two distinct paintings of the same title by Caravaggio. The latter version is a reworking of the first. The scene is a small table at an inn. In the center sits Jesus who is present after his resurrection. With him are three of his disciples, who appear amazed that Jesus has risen from the dead, although in the second version they are more subdued. The earlier 1601 depicts only Jesus and the disciples, but the latter version adds a wizened, elderly servant women standing by the table and looking over the shoulders of the men. The earlier version is also brighter and the food laid out upon the table is more plentiful and appetizing in appearance, whereas in the 1606 version, the meal consists of a two small loaves of dried, cracked bread, and possible a dried fish. It is difficult to know why Caravaggio first depicted Jesus in a more colorful joyful light, and then recreated the image in darker, muted tones, including the much more subdued body language of the disciples. Some art historians say Caravaggio wished to emphasize presence in the latter, rather than the drama of the first. It is believed the paintings were commissioned by Marchese Patrizi, although this is not 100% certain. It is known that Patrizi held the works in his collection in 1624. Caravaggio was born in Milan 1571 and died in 1610. His birth name was Michelangelo Merisi. He is considered instrumental in the founding of the Baroque school of painting. The 1601 version of Supper At Emmaus currently hangs in the National Gallery in London, while the other is on display at the Pinacoteca di Brera in Milan.